A tumultuous 2016 may be winding down, but Bitcoin’s massive 2016 run shows no sign of slowing. Bitcoin has crossed the $15 billion dollar line in market cap, setting an all time high. As reported by Bloomberg, Bitcoin raced past every other currency in 2016, gaining 79%. The sheer strength of this move flies against conventional reasoning for bull runs in bitcoin. The US Stock Market is sitting at all time highs and the Dow Jones Industrial Average is nearing historic levels at 20,000. In years past, a strong US market would usually be viewed as a bearish signal for bitcoin. This has certainly not been the case in 2016, where both are setting record highs. Technical signals for bitcoin remain extremely bullish, both short-term and long-term. As shown on the TradingView chart below, bull moves of $20-$35 have been occurring regularly following short periods of consolidation. This can be seen between 18:00 GMT and 06:00 GMT, where price action stabilized slightly below the $900 level. $900 had shown genuine resistance several times over the past 48 hours, but just as in previous days bitcoin made a $20+ bull run immediately after that resistance was broken. Short-term traders are in a great position right now. Frenzied buying when each resistance level crumbles means volume is high and reliable patterns are discernible. A look at the RSI levels above show our classic indicators of 30 and 70 are clearly defined points of movement. At 16:30 GMT we can see the sudden plunge below 30 and the immediate pop afterwards. 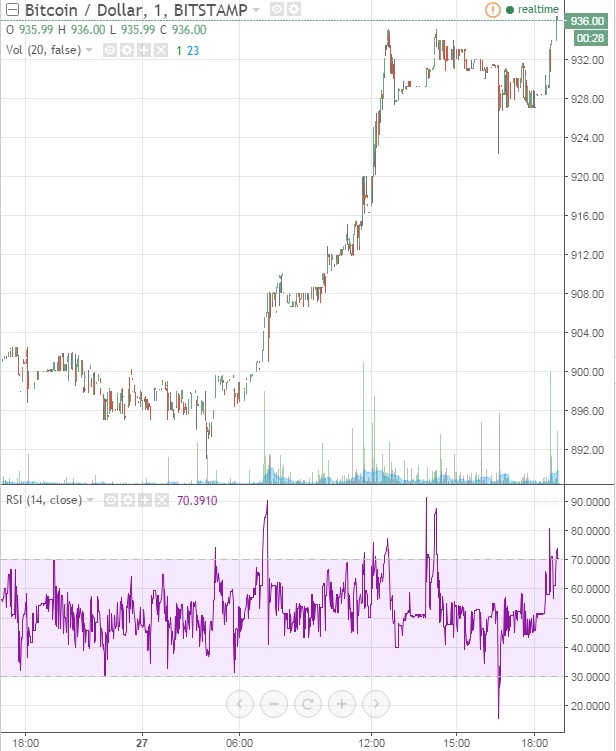 Conversely, each of the four occurrences of RSI topping 70 was followed by an immediate drop after. Based on these clearly defined patters, short traders can establish a long position below 30 RSI, and then quickly sell into strength. Short positions can be established when the RSI goes above 70, which should be quickly sold into weakness. Long-term traders can feel good knowing bullish sentiment is high for several reasons. Most prominent are the capital controls currently being exercised in China, India, and Venezuela. Chinese government restrictions on currency spending have been a main contributor to the bull run Bitcoin is experiencing. These restrictions do not look to be lifted anytime soon, especially with the American President-Elect Donald Trump looking to challenge China. India has started to phase out cash, and Venezuela finds it’s cash is worthless due to massive inflation. While there are several clear bullish signs, remember that nobody ever lost money taking profit. The next resistance line is technically at the $980 level, but since it has only been breached once previously, that information is hardly reliable.